The number of private cars has a blowout growth with the development of economics, which leads to the existing limited traffic resources cannot meet the normal traffic demand. The emergence of intelligent traffic has improved this phenomenon. Using intelligent traffic technology to conduct intersection vehicles can alleviate the congestion effectively. Traffic signal timing method plays an important role in intelligent traffic research. An independent intersection dynamic timing method combined with fuzzy control theory and improved ant colony algorithm is proposed in this paper. According to the characteristics of traffic flow distribution, the timing period is obtained with the improved webster algorithm. 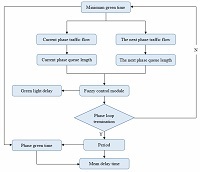 Through the optimal solution obtained by ant colony algorithm and the added delay of traffic signal calculated by fuzzy control method, the dynamic timing period of the traffic signal is obtained. The validity of the proposed method is proved by comparing with the original time period and the traditional algorithm. A. J. Miller, “Settings for fixed-cycle traffic signals,” Journal of the Operational Research Society, vol. 14, no. 4, pp. 373-386, December 1963. M. D. Foy, R. F. Benekohal, and D. E. Goldberg, “Signal timing determination using genetic algorithms,” Transportation Research Record, no. 1365, pp. 108-115, 1992. B. Park, N. Rouphail, and J. Sacks, “Assessment of stochastic signal optimization method using microsimulation,” Transportation Research Record: Journal of the Transportation Research Board, vol. 1748, pp. 40-45, 2001. C. P. Pappis and E. H. Mamdani, “A fuzzy logic controller for a trafc junction,” IEEE Transactions on Systems Man & Cybernetics, vol. 7, no. 10, pp. 707-717, October 1977. B. Abdulhai and R. Pringle, “Machine learning-based adaptive signal control using autonomous Q-learning agents,” Proc. the IASTED International Conf. Intelligent Systems and Control, pp. 14-16,August 2000. J. L. Duan, “Research on dynamic timing optimization algorithm for urban traffic lights,” M.S. dissertation, Shenyang Univ., 2014. M. Dorigo, V. Maniezzo, and A. Colorni, “Introduzione agli algoritmi naturali,” Rivista Di Informatica, vol. 3, pp. 179-197, 1994. H. P. Lu and R. M. Li, “Development status and trend of urban intelligent transportation system,” Engineering Research-Engineering in the Interdisciplinary Perspective, vol. 1, pp. 6-19, 2014. Y. K. Huang, R. Z. Ding, and Z. W. Zhao, “Urban main road traffic light optimization and simulation program,” Shandong Industrial Technology, vol. 9, pp. 55-57, 2014. S. Q. Liao and Y. L. Wang, “Traffic signal timing model and genetic algorithm at single intersection,” Highway and transportation, vol. 3, pp. 45-48, 2012. X. Liang, Y. H. Yin, and Y. Wu, “Dynamic optimization of signal timing in single intersection,” Highway Traffic Technology, vol. 2, pp. 125-127, 2010.